Have some laughs with the Aussie swimmers. Cam McEvoy (above, right) anchored the Australians to a 400 free relay time that should lock-up their qualification to Rio. Mack Horton logged his name on the list of legendary Australian distance aces, such as Grant Hackett, with an incredible 1500m freestyle effort tonight in Adelaide. 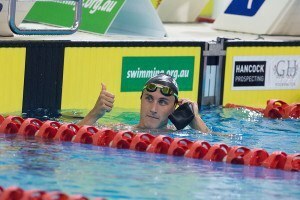 Cameron McEvoy completed a historic trifecta with his 50m freestyle win on day 7 of the Australian Olympic Trials. It was no surprise to see a Campbell sister come out as the top seed from this morning’s prelims, the only question was which sister would it be. 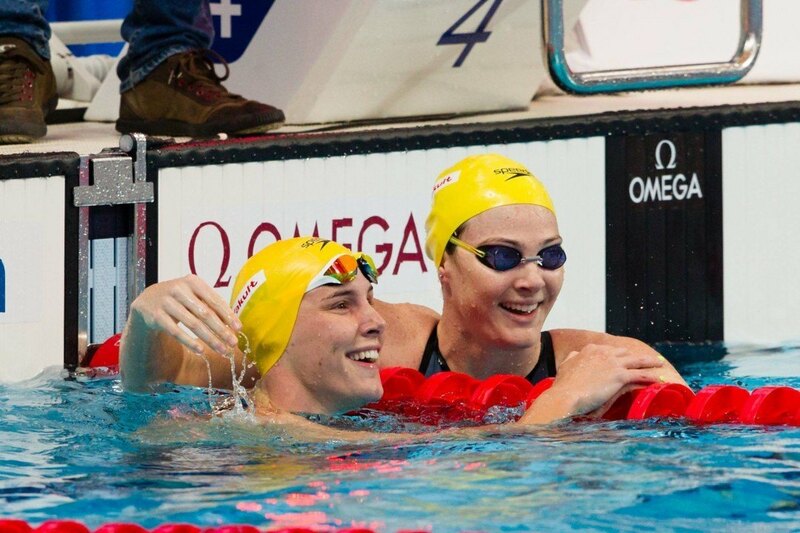 In Adelaide, sister Cate Campbell clocked the morning’s fastest 100m freestyle time, stopping the clock at a time of 53.25. Just that prelims swim alone registers within the top 5 times in the world this season, although Cate already holds the 2nd-swiftest in the world in 52.84 from December’s Queensland Championships. The reigning World Champion in this event, sister Bronte Campbell, held her cards close this morning, scoring the 5th-fastest time with a result of 53.73. She, too, sits within the world’s top 3 from an earlier season swim. 52.98 is what Bronte clocked at the FINA World Cup in Beijing to rank only behind world leader Sarah Sjostrom and sister Cate. Sweden was represented in this race in the form of 22-year-old Michelle Coleman, who trains at the Miami Swimming Club, home of Grant Hackett. As non-Australians cannot progress past prelim swims, this was Coleman’s final and she swam it as such, logging a time of 53.54. That signifies a brand new personal best for Coleman and the mark also dips under the FINA A cut of 54.43. Also of importance is the fact that Sweden’s 4×100 freestyle relay just got a tad scarier, with Coleman and Sjostrom as 2 likely instrumental components. 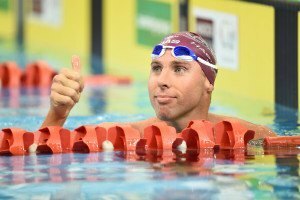 Red-hot Emma McKeon and veteran Olympian Alicia Coutts are also in the mix, earning times to rank within the top 8. It’s also reassuring for Aussie fans to see Brittany Elmslie situated as the 3rd seed out of prelims. The 21-year-old Brisbane Grammar swimmer suffered a setback last year where she underwent surgery to remove a benign tumor. Sprinters around the world may tremble at the fact that Aussie just put up 3 sub-54-second 100m freestyle times….just in prelims. The Australian and Commonwealth Record Holder in this event, Mitch Larkin, simply puts on a clinic every time he enters the pool. Even in this prelim swim, Larkin looked at complete ease, yet efficiently stroked down the pool until he touched in a time of 1:57.27. That walk in the park still checks in as the 15th-fastest time in the world this season. 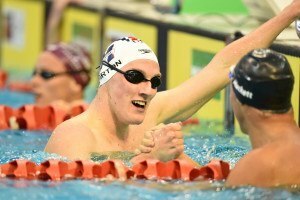 Along with the title of 2015 World Champion in this event, Larkin also owns this season’s fastest time with the 1:53.17 he registered at the FINA World Cup in Dubai. That’s the mark which made Larkin the national record holder and big-time favorite for gold in this event domestically and also a heavy podium favorite for Rio. The next closest swimmer this morning was 23-year-old Josh Beaver, the man who took silver behind Larkin in the 100m back event earlier in the meet. Beaver touched in 1:59.65, so he needs to improve by more than a second in order to clock a FINA A cut of 1:58.22. Chandler’s Jared Gilliland was the only other swimmer to dip beneath the 2-minute threshold this morning, coming in as the 3rd seed in 1:59.84. That’s the first time Gilliland finds himself on the faster side of 2 minutes, scoring a lifetime best as momentum headed into semi’s. Taylor McKeown nabbed the top seed with a time of 2:27.38, less than a second off of the FINA A cut of 2:26.94. She’s been as fast 2:23.94, a time which ranks as the 1oth-swiftest in the world this season, so look for the 21-year-old to crank it up during the next round. McKeown already earned an Olympic berth via her 100m breaststroke silver on night 2. As McKeown was the only sub-2:30 swimmer on the morning, runner-up seed Sally Hunter, at 30 years old, claimed a time of 2:30.71 to edge out 19-year-old Jenna Strauch who touched in 2:30.89 to rank 3rd. 15-year-old Acacia Bayside swimmer Sarah Beale clocked 2:32.02 for the 4th seed, while St. Peters and Western’s Georgia Bohl stamped a top-8 time in 2:33.08. Winner of the 100m sprint breaststroke event, Bohl’s lifetime best in this longer distance is the 2:25.61 she registered last month at New South Wales State Championships. Already on a roll from his earlier 400m IM victory and 200m freestyle win, 24-year-old Thomas Fraser-Holmes continues his fiery campaign, earning the top seed in the men’s 200 IM event. Headed into the meet, Fraser-Holmes’ personal best was the 1:58.83 he scored just last summer while competing in Kazan. That result netted Fraser-Holmes a semi-final appearance, but not speedy enough for the final. Already today he’s within one second of that mark and well under the 2:00.28 Olympic automatic-qualifying time, so the Miami Swimming Club athlete is starting things off on the right foot. 25-year-0ld Travis Mahoney, who cranked out a silver medal finish in the men’s 400m IM, is situated as the 5th seed in the shorter IM event, earning a mark of 2:03.24 to tie with Clyde Lewis, the reigning World Junior Champion in the event. North Baltimore Aquatic Club-trained Daniel Tranter is lurking in the 4th spot after prelims, earning a mark of 2:02.12. Tranter has been as fast as 1:58.73 at this same meet last year, so he has podium potential, provided he performs well enough to proceed to the final. Turning on the tough double is Jared Gilliland, who already scored a semi-final swim competing in the 200m backstroke this morning and now he holds the 7th seed in this 200m IM event. We’ll look to see if he maintains both races through semi’s. Of note, Trinity Grammar’s Kenneth To, who entered the meet as the 6th seed was a scratch for the event. To is in a position to score a relay spot in the men’s 100m freestyle, so it’s possible he held off on this 2IM to conserve energy for that race. This non-Olympic event saw Jack McLoughlin clinch the gold in a time of 8:00.71. 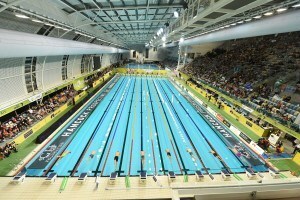 McLoughlin earlier earned bronze in the men’s 400m freestyle event and set to contend the 1500m freestyle in Adelaide. Next in line this morning was Marion Swimming Club’s Ethan Owens who, at just 19, scored a time of 8:06.70 to represent the only other sub-8:10 swimmer of the group. That’s a best time for the youngster and also a silver medal. Man Larkin looked like he was asleep that first 125 meters. It’s ridiculous how much better he is than everyone else. His individual 100 was just a tad off, but I still wouldn’t be surprised if he went 1:53.9-1:54.2 here. Brittany Elmsie, who has had a cancer scare last year, has shown while she has not done the work to get her 200 back to where it was, her 100 tonight shows that at 53.63, she is back to her very best for the 100 & if this is our 4th swimmer in the relay, thank you very much. I am rooting for Britanny.A great stroke in a lean and a tall swimmer finally coming together.But looking at Emma, she looked to be holding a LOT at the end of her race. Yes, I’m expecting Emma to join the Campbell sisters into the 52s by tomorrow night, even if Britanny doesn’t improve her time that is a pretty impressive 4th swimmer & expecting Wilson, Seebohm under 54s. The weird one is Emily Lui? Doesn’t anyone know anything about this? It was a typo.I was watching the race and got really confused when I didn’t remember her swim(I was so distracted watching Cate vs Elmslie, I thought I let slip). Crazy. The Aussie girls are gone to win the Rio 4×100 relay by over 2 seconds. The Dutch girls are not looking too good based on tonight’s performances. I pick the USA for 2nd in this relay. I think Canada has a chance to upset for bronze. This is just the heats too!!! !